At Parkhill Infants’ School we promote Fundamental British Values through our ethos, curriculum, Spiritual, Moral, Social and Cultural education and through our work as a UNICEF Rights Respecting School. 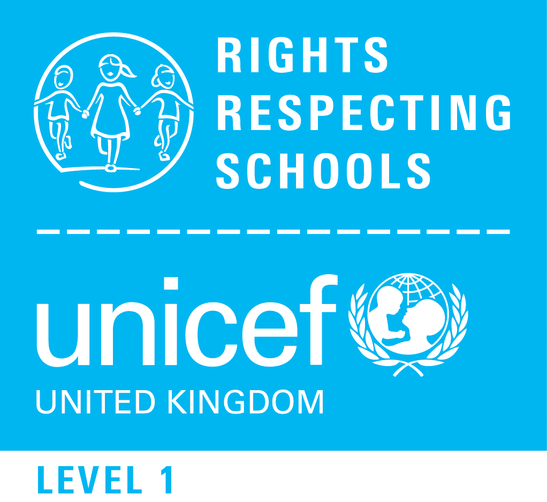 We are proud to be a Level 1 Rights Respecting School and of the fact that the Rights Respecting Schools agenda and its values are firmly embedded in the ethos and practice of our school. Every class has a unique charter based on the Convention on the Rights of the Child. Children decide upon the design of their charters and the rights that will be displayed with them. The charters are used in circle time sessions and as a way of reinforcing positive behaviour, fairness and tolerance. Charters are also prominent in other shared areas of the school so rights respecting language and behaviour permeate all areas of school life. All children are listened to by staff in a calm and caring manner and our strong ethos is supported by effective relationships throughout the school. Adults and children clearly model rights respecting language. This has given the children a powerful tool for resolving minor conflicts. The children are given many opportunities for their voices to be heard. We have a school council which meets regularly to discuss whole school matters and issues raised by the children. Each class representative is elected by their peers in a fair and democratic way. Our UNICEF ambassadors also attend school council meetings but focus on rights and fundraising within the school. The staff and pupils have made a short film which promotes the Rights Respecting agenda to parents. This is very important to our school, as it shows the way in which children’s rights are learned, taught, practised, respected and promoted in school. Children are taught about the value and reasons behind laws and the way in which they govern and protect us. They are also taught about the consequences when laws are broken. The children often discuss what it would be like to live in a country which does not protect children’s rights. In their own behaviour children are encouraged to accept responsibility for their actions, to find solutions to problems and to resolve conflict. Children are actively encouraged to make choices within a safe and supportive environment. Through high quality education we provide boundaries within which children can take ownership of their own decision making and learning. Children are taught to know their rights and to understand and exercise them safely; for example through safe use of the internet. At school, children are given the opportunity to make many choices during the school day or through access to extended provision. We have a range of sporting clubs such as gymnastics, football and multi-sports as well as breakfast club, lunchtime club and active morning club. Pupil premium funding ensures fair access for children from low income families. We expect all members of the school community to treat each other with respect as this is at the heart of our ethos and values. In school respect is discussed at all levels: family, school, community, throughout the world and the environment. Children are taught how to show respect to others in circle time and PSHE sessions and respect is carefully modelled on a daily basis. We also encourage mutual respect more globally. We are committed to supporting Fairtrade practices. During Fairtrade Fortnight we teach the children about the importance of choosing Fairtrade products and the impact these choices have on the lives of other people and their families. Our annual Fairtrade breakfast teaches children about the challenges faced by farmers and workers throughout the world and how we can make a difference to their lives. Children are empowered to become active citizens and learners through fund raising projects such as Comic Relief, Operation Christmas child shoebox appeal, Jeans for Genes day, Children in Need, Day for change, Redbridge Foodbank and very importantly our local Haven House Hospice. Regular assemblies and topics about inspirational people encourage children to think about the kind of adults they would like to be. During Black History week children talked passionately about Rosa Parks and could say how she had fought to have her rights recognised. We are an inclusive school with a diverse community. We celebrate cultures, faiths and beliefs by learning about different religious festivals throughout the year. We encourage children to identify similarities between faiths and between each other. For example, the importance of light at Diwali, Eid, Hannukah and Christmas. Cultural dress days and our Article 7 week have helped children to share their culture and identity with others. We also celebrate National Events. Our English conversation classes and Parent and Toddler groups support families and further develop the strong sense of community within the school. Through our RE syllabus, PSHE curriculum, Rights Respecting School agenda and assembly programme, we reinforce our commitment towards building a more tolerant society. At Parkhill Infants’ School we will actively challenge pupils, staff, parents or anyone in the school community expressing opinions contrary to fundamental British Values, including ‘extremist’ views.